Is there a way to change the widths of a compound path's strokes independently? The stroke width tool in Illustrator features some really unpredictable behaviour when used on a compound path. When I change the width on one part of the compound path, Illustrator applies that width change to the other part as well. This is a compound path: a circle with a smaller circular hole in it. I need it to be a compound path to have the hole. 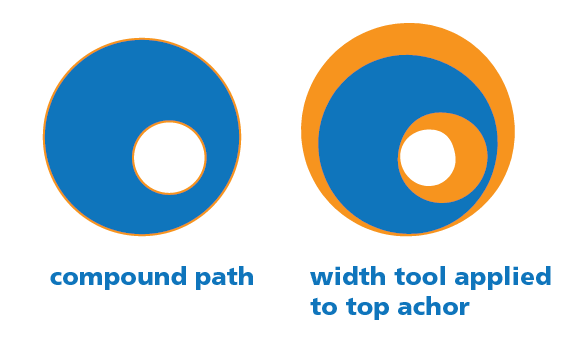 However, in the right picture I applied the Stroke width tool to the outer path's top anchor only, yet Illustrator goes ahead and applies the change to the inner circle as well. Compound shapes are seen as a single object therefore any stroke is seen as a single stroke as well. Any width variation is applied to the entire stroke, even if that stroke is visible for counters. The simplest solution is to use separate objects for fills and strokes. In the case of your circles sample, I'd use 3 objects. One for the fill, then two objects with just strokes on top of the fill. This would allow you to independently alter the stroked objects. I don't know of any other method for variable strokes on compound shapes. Of course, you could always expand the object and then add a stroke to the (now expanded) strokes and adjust that. But that seems even more convoluted. Can't be done as far as I know, but your could just draw another circle on top of your compound path and add the stroke effect you like. Not the answer you're looking for? Browse other questions tagged adobe-illustrator path stroke or ask your own question. Why Illustrator CS5 Expand breaks my shape? How to view width of a path's stroke in millimeters in Illustrator CS6? How do I subtract the inner path from the outer circle in Adobe Illustrator? How do you create an arc for text without distorting in Illustrator? Does giving manual radius to a shape makes it look bad?